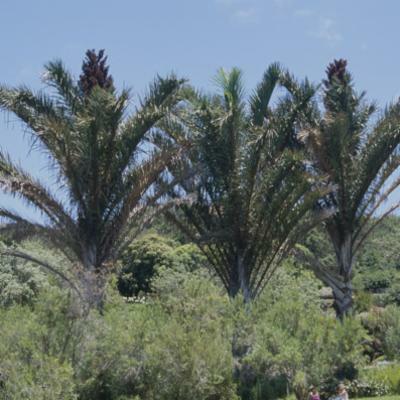 This genus is accepted, and its native range is Tropical & S. Africa, W. Indian Ocean, Central America to Brazil. 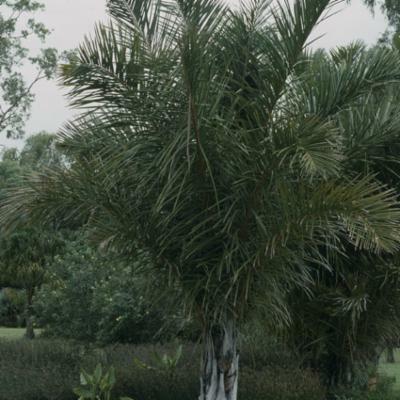 Generally massive acaulescent or tree palms of Equatorial Africa, Madagascar and South and Central America, with huge pinnate leavesand often fibrous leaf sheaths; hapaxanthic and monoecious, the rachilllae bear solitary pistillate flowers near the base and solitary staminate flowers distally. The fruit is usually very large. 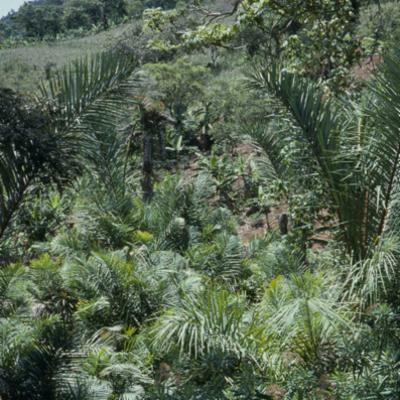 Most species of Raphia seem to be plants of swamp lands, but R. regalis occurs on hillslopes in humid tropical rain forest. Leaf, petiole, stem, root (Tomlinson 1961), root (Seubert 1996a). 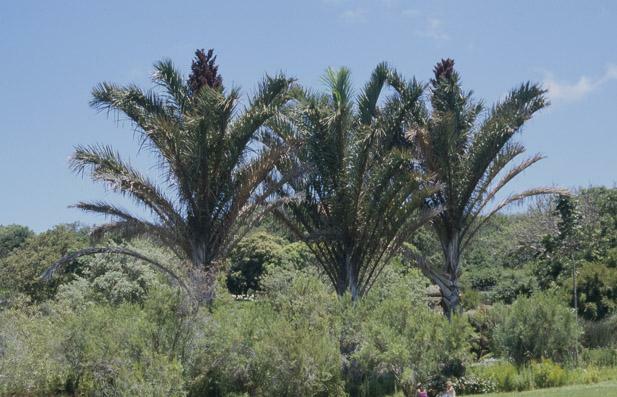 Massive, solitary or clustered, armed, hapaxanthic, monoecious, acaulescent or tree palms. 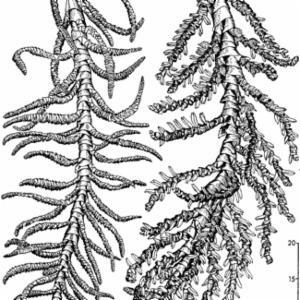 Stem subterranean to erect, usually partly obscured by the marcescent leaf bases, the internodes sometimes bearing short, negatively geotropic, ± spine-like roots, cortex hard, pith soft. Leaves massive, pinnate, marcescent; sheath unarmed, splitting opposite the petiole, with or without a conspicuous ligule, disintegrating into thin sheets or sometimes partly into black fibre bundles (‘piassava’); petiole short to very long, unarmed, usually deeply channelled adaxially only at the base, rounded distally; rachis unarmed, angled adaxially, rounded abaxially; leaflets single-fold, linear, numerous, regularly arranged or grouped and fanned within the groups to give the leaf a plumose appearance, often whitish beneath, armed with short spines along the margins and the midrib, the margins frequently greatly thickened, midribs very large, transverse veinlets conspicuous or inconspicuous. 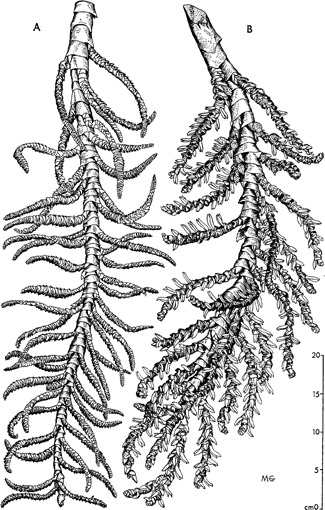 Inflorescences branched to 2 orders, produced simultaneously in the axils of the most distal few leaves, either interfoliar and pendulous or aggregated into a massive, erect, suprafoliar, compound inflorescence; peduncle short; prophyll tubular, 2-keeled, closely sheathing to inflated, sometimes splitting opposite the keels, with 1 or 2 short triangular lobes; peduncular bracts several (ca. 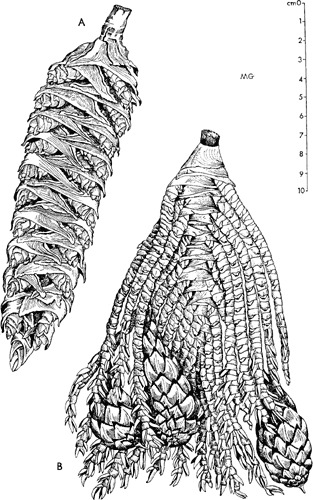 6) and inflated basally with triangular limbs; rachis much longer than the peduncle; rachis bracts distichous or in 4 ranks, tubular, closely sheathing to somewhat inflated, usually each subtending a first-order branch, rarely empty; first-order branches reflexed or variously spreading, sometimes scarcely exserted from the bract, bearing a basal, 2-keeled, tubular prophyll, and distichous or 4 ranked, tubular bracts with triangular limbs, each, except for the prophyll and 1–few basal-most, subtending a rachilla; rachillae very crowded to distant and sometimes not exserted; rachilla prophyll tightly sheathing, 2-keeled;subsequent rachilla bracts tending to be distichous or in 4 ranks, tubular, tightly sheathing, with short, striate triangular limbs; distal 1–3 bracts empty, of the remaining, the proximal bracts from 1/4 – 2/3 the rachilla length each subtending a pistillate flower and 2 prophyllar bracteoles, the distal, each subtending a staminate flower with a single prophyllar bracteole, very rarely at the junction between staminate and pistillate parts of the rachilla, the bract subtending a dyad of 1 staminate and 1 pistillate flower; rarely in apical portions of the inflorescence, rachillae bearing staminate flowers only. Staminate flowers conspicuously exserted; calyx tubular, shallowly 3-lobed; corolla greatly exceeding the calyx, sometimes glossy, tubular at the base, with 3 elongate, triangular, sometimes spine-like, valvate lobes; stamens 6–30, filaments narrowly spindle-shaped, joined to the corolla near the base, variously distinct or connate into a fleshy tube, abruptly contracted at the connective, anthers elongate, sagittate basally, uneven distally, introrse or latrorse; pistillode absent or minute. Pollen ellipsoidal, bi-symmetric; aperture a distal sulcus, often notably shorter than long axis; ectexine tectate, scabrate, perforate, perforate-rugulate, rugulate, or granular-rugulate or, rarely, ectexine intectate and sparsely spinulose, aperture margin similar; infratectum usually very dense and narrow, barely columellate, although in some species interrupted by wide cavities; longest axis 17–35 µm [13/20]. Pistillate flowers sometimes only partly exserted from the rachilla bracts; calyx tubular, ± truncate or shallowly 3-lobed, later splitting; corolla exceeding or scarcely longer than the calyx, tubular in proximal ca. 1/2, distally with 3 valvate, triangular lobes; staminodes united into an epipetalous ring, with 6–16 irregular teeth of varying lengths bearing the flattened, sagittate, short, empty anthers; gynoecium tricarpellate, triovulate, ovoid to somewhat conical, with a short style and conical 3-lobed stigma, locule partitions incomplete, ovule basally attached, anatropous. 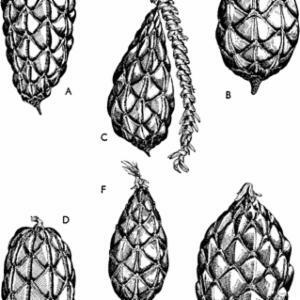 Fruit usually large, elliptical, 1- seeded, with apical stigmatic remains; epicarp covered in neat vertical rows of large reflexed scales, mesocarp thick, mealy, oil-rich, endocarp not differentiated. 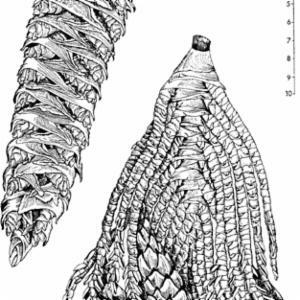 Seed subbasally attached with dry seed coat, variously coarsely furrowed, endosperm with a few large ruminations; embryo lateral. Germination adjacent-ligular; eophyll usually pinnate, more rarely bifid. Cytology: 2n = 28. 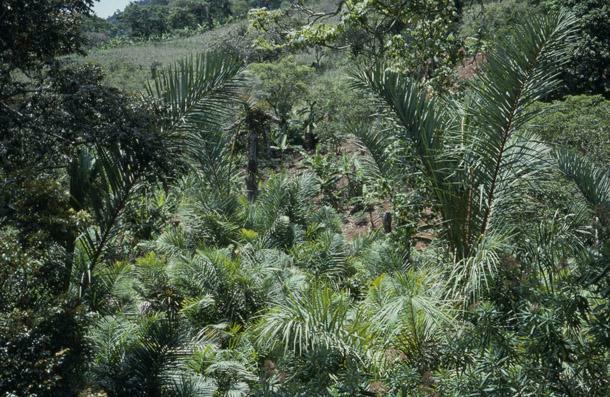 Twenty species, throughout the more humid areas of Africa; one species in Madagascar possibly introduced; one species, Raphia taedigera, in tropical America but stated by Otedoh (1977) also to occur in West Africa and to be introduced in tropical America (this, however, seems unlikely). Seed with a moderately thick, rather dry testa and endosperm penetrated by rather large ruminations; embryo lateral Germination adjacent-ligular; seedling leaf pinnate. Species of Raphia are of extreme economic importance. Raphia fibre is obtained by stripping off the cuticle and hypodermis from the emerging leaflets; locally it is used for a wide range of purposes, such as basketware and twine, and it is exported for garden twine and weaving. Piassava is obtainable from the leaf sheaths of R. hookeri. Petioles of many species are used as a substitute for bamboo in house and furniture construction and leaflets are used for thatch. 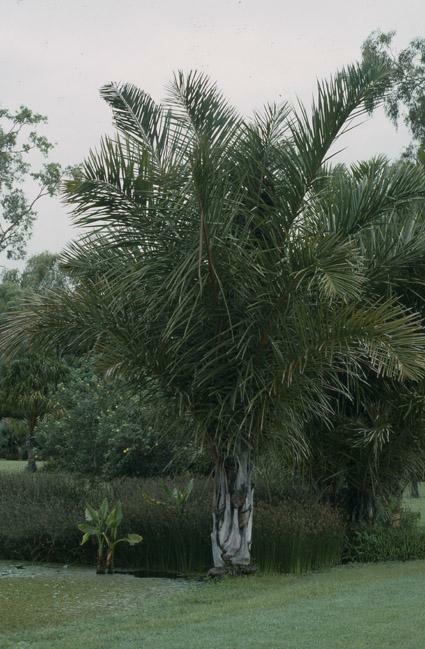 Palm wine can be obtained by tapping the stem apex. The mesocarp of some species provides a source of cooking oil. 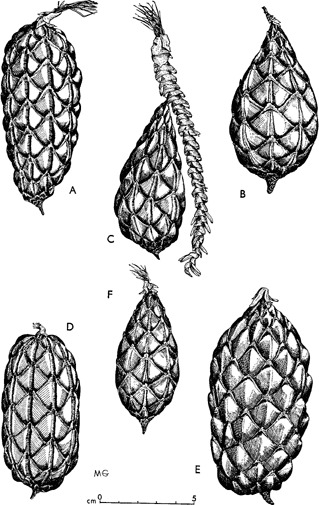 The kernels and stem apex are sometimes eaten. The fruit of some species is used as a fish poison. Russell in Kew Bull. 19: 173-196 (1965).